Governor Dayton released his list of payoffs to his key contributors budget yesterday. But the Governor released the budget at an 11AM press conference yesterday. Maybe Carrie Lucking is an incredibly fast reader. Of course, she’s also romantically involved with Dayton’s deputy chief of staff Bob Hume. 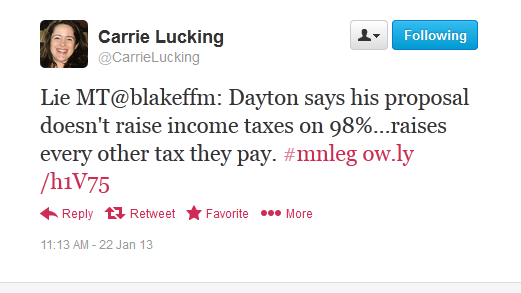 I thought that showed too much faith in Governor Dayton. I think it’s more likely ABM gave the budget to the Administration. Either way – I need your help here. Back in the 2000s, the media spun up a tempest in a teapot over Governor Pawlenty’s involvement with an outside group, and the potential impact that had on the Pawlenty Administration’s message and policies. It passed quickly, because there was no there there. But the media gave it its’ 15 minutes. Does anyone remember the parties involved in that? I only remember the dimmest possible outlines of the episode. But compared with the collegial clubbiness between the Twin Cities media – especially the Strib and the MinnPost – and the various political non-profits and advocacy groups, I think it’d be useful for comparison’s sake. UPDATE: I need to point out that the heavy lifting on Twitter was done by Dave Thul and Sheila Kihne. They smelled the rat. I just wrote about it. This entry was posted in Big Left, Big Leftymoney, Media Bias, Minnesota Politics and tagged ABM by Mitch Berg. Bookmark the permalink. Are you referring to T-Paw appointing Jon Grunseth’s ex-wife Vicki to serve as MAC chair? It was alleged that she was involved in previous business dealings with Pawlenty.